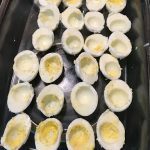 Cut each egg in half, lengthwise. 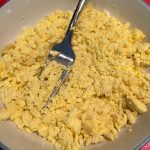 Gently scoop yolks into a small bowl, and mash with a fork. Add all remaining ingredients (except paprika), and mix together. Arrange egg white halves along the bottom of a 9x13 pan. Fill each egg with yolk mixture, as shown. I used a spoon, but if you want to be extra fancy, feel free to try a pastry bag. Sprinkle with paprika, and serve. Why would eating eggs give you a headache? That's an odd reaction. If you think you're allergic, you should mention that headache to a doctor and get skin tested for egg allergy, which can get worse over time and with more exposure. There are vaccines that have egg protein in them, and you could be in big trouble if you get one without realizing first that you're allergic to eggs. It concerns me that you would react like that after eating eggs. Doesn't sound like an allergy just sounds like a reaction. My husband gets terrible migraines that are triggered by certain foods and seasonings. Definitely not unheard of Ellie! You should invest in an egg dish, if you're taking deviled eggs places. They slide around so badly, even if you do cut a little off the bottom. Even using paper cupcake liners works in a pinch. I have a Rubbermaid egg carrier with lid for travel, and several ceramic egg dishes for home. This time of year (Easter coming) is a really good time to find egg dishes on sale in the home stores or craft stores. If you can't find one on sale soon, look for them at thrift shops and yard sales. Some misguided person cleaning out a parental house might be foolish enough to accidentally part with one. They do turn into heirlooms you know, and not everyone lets them go! I have a rubbermaid egg carrier too. I saw basic white ceramic egg dishes at Target yesterday for $9.99. They also had some in an Easter display, but they were smaller, had a gold rim, and were $19.99, I think? The basic ceramic ones would hold 18 egg halves (I stood there and counted). I didn't check the Rubbermaid aisle. The trickiest part to an egg plate is covering it for the fridge. I usually stick in some toothpicks or wad up some wax paper to keep the Saran off the egg filling. Otherwise, it can mess up your nice neat pastry bag swirls, or pull filling with it when you remove the Saran. Great time of year to share this post with Easter coming soon!! 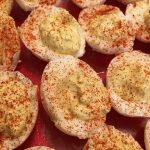 My husband loves deviled eggs. That's very interesting, Eileen. I take Vitamin D supplements daily, but I'll have to look into the connection. Thanks! Ellie made me use allergic to the white vinegar. I don't put vinegar in mine I just make it with mayonnaise and yellow mustard. Funny how everyone calls recipes "tutorials" these days. When you take someone through a recipe step by step, with pictures along the way, it does become tutorial-ish. But I see your point. We had recipe tutorials long before digital cameras and the Internet. It was called standing beside someone and watching how they did it! I would leave out the two tablespoons of white sugar. Can you do a pickled egg recipe now please? It's only 2 teaspoons. 🙂 The taste would be quite different without the sugar, but you could give it a try. I have never tried pickled eggs. What do they taste like? Do you mean red beet eggs? Sometimes I get a headache from eggs too. I thought I was the only one!! Strange! My headaches are very minor, so I have resolved just to avoid eggs whenever possible. How bad are your headaches? That filling looks a little runny. I don't think piping it through a pastry bag would be of any good. How could you tweak it to be more firm? Don't add the vinegar. Without the vinegar, I don't think the sugar would be necessary either. The fillings done through a pastry bag with a star tip, to make the swirl, do need a firmer consistency to keep their shape. It's wet, but not runny at all, although I know it appears that way in the pictures. If the consistency isn't to your liking, try adding extra egg yolk, or cut down on the vinegar by a bit. That much paprika on the eggs makes them look unappealing to me. Mom only put a sprinkle of paprika on the yellow part, which is what I do, too. She kept some paprika in a little pointed antique salt shaker, which gave her control over where the paprika landed on the egg. I have that shaker now and use it the same way. Yes, my mom only put paprika on the yellow part too. When it's sprinkled all over the whole egg, that's when it looks very unappealing. I just put paprika on the yellow part too. Did you know there are entire cookbooks devoted to the subject of deviled eggs? I have one. Look it up on Amazon. Just search for "deviled eggs" in the Books section. You'll also see the myriad of serving plates and storage containers available for these eggs, sold on Amazon. But read the reviews before buying. Wow, that's impressive. Didn't realize there was such an art to making simple deviled eggs. I'll have to check those out! These look great! Ellie, is there a spice I could substitute for paprika? I have a daughter who can't eat it. Thanks! I would just omit it. Some people put a little sprig of parsley, a ship of chives, or a slice of olive on top. Anything goes. Yep, you can definitely omit it. They are delicious with or without paprika. Sweet pickle relish is supposed to be in deviled eggs. I always used red "hamburger" relish but then Heinz stopped making it. Haven't found an acceptable substitute yet. I always put some minced onion,(scallions if I have them), minced dill pickles and use a Miracle Whip type dressing. No sugar or vinegar. If I have sweet pickle relish use that instead of pickles. 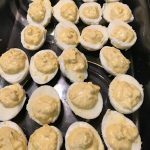 My husband absolutely LOVES the way I make them and they are always a great hit at potlucks. 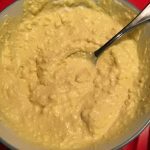 I use the same additions to make tuna salad, adding shredded cheese for tuna melts. Sweet pickled relish in deviled eggs it's gross. Relish is only used for hot dogs. Relish in eggs makes me want to throw up. All my friends and family make it with just mayonnaise and yellow mustard and paprika. 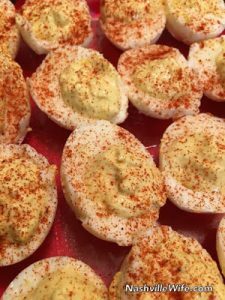 I did once make deviled eggs with dark mustard and it was good I din't like yellow mustard that much. I think the hardest part of making deviled eggs is getting all the shells to come off. There are always a few that want to stick. I usually hard boil extra eggs to allow for this. I know there are all sorts of scientific theories about how to keep the shell from sticking, and I've tried most of them, but I have yet to find a way that works every time. If the shell is going to stick, that's it. Not much you can do about it but move on to the next egg and try again. If I want 12 eggs to devil, I'll cook 18 eggs to be sure I get at least 24 nice halves. What you do then it put them in the refrigerator for a little bit before you take the shells off that what I do and they come off fine for me. I've tried everything… Salt and vinegar in the water, the ice water bath after cooking, cracking right away, peeling under running water, fridge resting, using fresh eggs, using old eggs, any "home remedy" for shells sticking there is, but the shells can still stick if they want to! They need to start feeding hens Teflon or something. Must be the kind of eggs do you get. I but the eggland eggs.